Plenty of Flounder in Poole if you have the right bait. Now let talk about the weather wind and rain and yet more wind and rain! I take my hat off to those hardy souls that braved the elements over the Xmas period, myself I only managed one session last Tuesday morning before storm Frank hit. 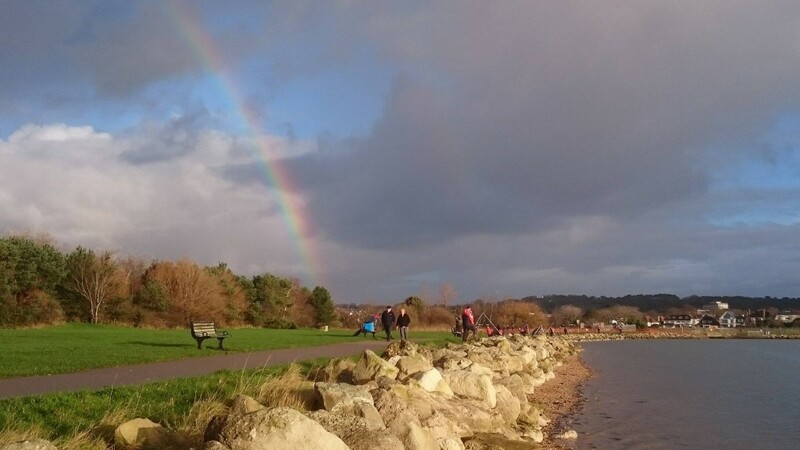 You can see live weather, wind, waves and tides for the area on our new Poole Harbour Live page. The brief window in gales saw me at Baiter Park. Unfortunately due the bad weather many of the bait draggers and diggers were unable to collect any ragworm. That coupled with all the club matches that took place between Xmas and New Year, one of the harbours top baits, ragworm, was in very short supply. Consequently I had to use lugworm, I hoped it was better than nothing, but I wasn’t surprised to sit for four hours without a bite. To add insult to injury there was a club match fishing to my left and I saw some nice flounders caught on ragworm. Best was 2lb8oz with some being caught close in! There has been much debate about how the weather is affecting the flounder fishing in the harbour the theory is its too mild and they are being put off with lots of fresh water draining into the harbour from the rivers. I think here are good numbers being caught but the biggest problem at the moment is finding a good couple of hours, day or night, where you are not going to get blown over or drowned in the rain! 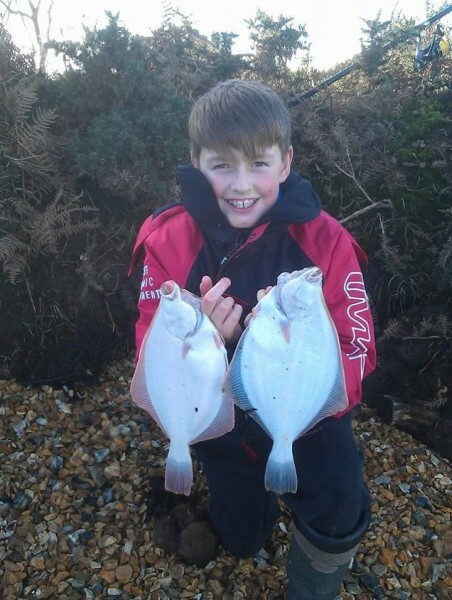 The Carter family have been taking advantage of the breaks in the weather manging to fish several marks around the harbour shores with some very good success! Chad Carter had one of the biggest a nice fat fish of 2lb 8oz with three others over the 2lb mark! 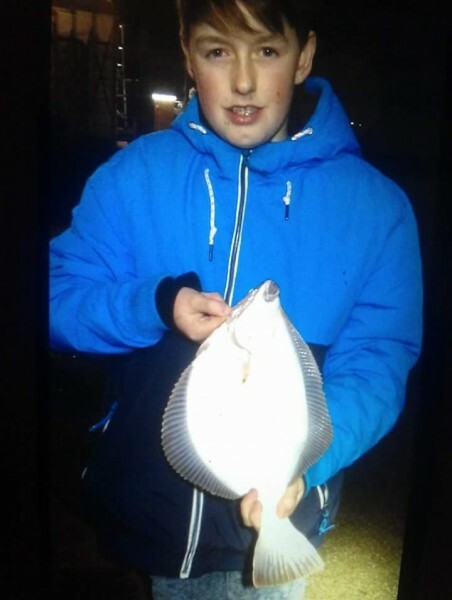 Old fishing pal Will Farenden proved flounders are being caught on the boats too when a trip out to the shallow mudflats of the harbour saw him landing three fish up to 2lb. After all the controversy surrounding these fish Bass have shown up all over the Xmas period. 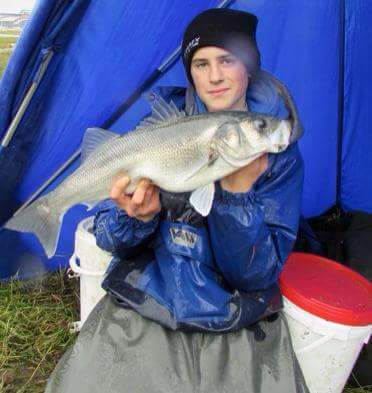 Tom Whartnaby made a good start to the year landing a three bass over 3lb in a session meant for flounder. The biggest a corker at 8lb 9oz. It’s not unusual to see the odd large bass caught during the winter, by anglers targeting flatties. What is unusual, looking at all the reports coming in from around the south coast is the amount of nice fish being caught! It might pay to have a second or third rod baited up with a large cod sized bait, you never know your luck this time of year! With this mild weather the flounder may hang around a little longer before they all disappear to deeper water to spawn. Certainly in colder years I’ve seen the flounder fishing all done and dusted by the new year. Perhaps if we are lucky they may hang on long enough to tide us over until the plaice season starts! Then we can only hope that the plaice fishing turns out anywhere near as good as last year! Out and about around the area. Avon beach has produced yet more good bass. Southbourne still has seen whiting with the odd ray. The Purbecks may well continue to fish well but I wouldn’t advise fishing there this time of year. I could be lethal! Fishing Tails > All Articles > Reports > Poole Harbour > Plenty of Flounder in Poole if you have the right bait. 6 Responses to "Plenty of Flounder in Poole if you have the right bait." Great article Leo, do you know how’s holes bay fishing at the moment? Or would u advice baiter park better? It has been ages since my last session due to work and family and Saturday I’m finally free to do a 9am to 3pm session. I’ll update you if I get anything worth it to be shown. I think both baiter and holes are fishing equally as well. Both have been producing good numbers of flatfish and both marks are known to catch a bonus decent bass! I would pick baiter personally as I know the area very well and my personal best of 3lb 2oz flounder has come from there. Equally holes bay is known as the big fish venue. I know of several flukes caught over 4lbs and a rumour of a 5lb fish a few years back!! Thank you for your reply Leo much apreciated, i may try both as i have quite a few hours out anyway and see how it goes! Hopefully there Will be a bass too during the session! I’ve never fished Poole harbour but quite fancy having a go. It seems from your comments that Baiters is as good a place as any to start. I probably won’t be able to get down for another week and I see the size of tides are dropping off – does the size of the tides matter so much for fishing here? Any advice re best states of the tide, day or night would be gratefully received.